During World War One, the Allies looked for a way to take the pressure off the Russians (who were fighting Germany in the east and Turkey in the south), to open up a supply route to Russia, and to perhaps knock Turkey out of the war. In February 1915, a British fleet, and a French Squadron, attempted to sail up the Dardanelles Strait to attack the Turkish capital of Constantinople. The attempt failed; several ships were lost, and the rest retreated. It was then decided to land troops on the Gallipoli peninsula, in order to silence the Turkish forts guarding the narrow strait, using troops from the British 29th Division, part of the Royal Naval Division, and a French division. At dawn on the 25th of April 1915, troops of the Australian and New Zealand Army Corps (ANZAC) were landed at what is now known as Anzac cove. Unfortunately, as the landing boats were carried north by a strong current, this was a mile north of the targeted area. Anzac cove had been described by General Birdwood as impossible for an attempted landing, and this pessimism was warranted by the cove's smallness (leading to impossible conditions of overcrowding, intermingling of units, and the resultant chaos) as well as its 300 foot high cliffs, with Turks positioned at the top. Unfortunately, the attempted naval attack in February had forewarned the Turks of the vulnerability of the Gallipoli Peninsula, and they had moved Turkish troops into the area. Coincidentally, and just as unfortunate, this area had been chosen by Lieutenant-General Mustafa Kemal as the place to carry out military manoeuvres. The Anzacs had to dash from their landing boats under heavy fire, rush across the open beaches, and climb up the steep ridges. The Anzac troops established a defensive line, and the next few months were taken up with improving the narrow positions that had been established. Many opportunities were lost, due to command blunders and indecision, despite the gains of the troops on the ground. Between April and December 1915 the Allies and the Turks attacked and counter-attacked, leading to enormous losses. Both sides received large numbers of reinforcements over that time, replacing those lost in the carnage of the often static fighting and horrific trench warfare. Finally it was decided by the Allies, on the basis of their being small chance of success for the Gallipoli campaign, to evacuate all allied troops. 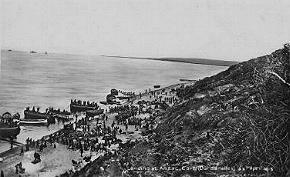 Such an evacuation was fraught with danger, especially at Anzac Cove with its steep ridges - as the Turks commanded the heights, they could decimate the Anzacs during a withdrawal. An ingenious evacuation plan was devised by Brigadier Brudenell White (the Australian chief of staff to General Birdwood). White ordered that the fighting at Anzac Cove be progressively slackened, thus accustoming the Turks to long periods of inactivity (indeed, for two days from November 24th no infantry or artillery guns were used at all). White's plan worked brilliantly - it was considered a remarkable success. The troops at Anzac Cove and Suvla Bay were withdrawn on the nights of the 18th and 19th of December 1915, with only six men being wounded in the process. The men at Cape Helles were later withdrawn on the 8th of January 1916. The Gallipoli campaign had lead to enormous losses for all those units involved in the fighting. Out of the total Allied casualties of 146,700 the Australians lost 7,818 killed and suffered 19,182 wounded. Despite the overall loss all the campaign, the Australians had proved their prowess as a fighting force. Gallipoli was the first time that Australian troops fought together as one (prior to this Australian units had been sent to war on a colony by colony basis). It has been said that it was at Gallipoli that Australians gained a new sense of nationhood; whereby any lingering considerations of ourselves as just Victorians, New South Welshman, Queenslanders, etc, were swept away, to be replaced by one united people: the Australians. Army: The First 200 Years, Australian Government Publishing Service (for the Dept. of Defence), Canberra, 1976, p. 6. The Australian Encyclopaedia, Angus and Robertson, Sydney, 1958, vol. IX, pp. 377-381. Chandler, David (general editor). Dictionary of Battles: The World's Key Battles From 405BC to Today, Ebury Press, London, 1987, pp. 170-171. Firkins, Peter. The Australians in Nine Wars: Waikato to Long Tan, Pan Books, Sydney, 1973, pp. 38-67. Shermer, David. World War One, Octopus Books, London, 1973, pp. 86-93.